We are asked this question all the time and always give the same answer. There is really no way to tell what pellet will work best in your gun without testing all the pellets in that caliber. That is why we designed the Straight Shooters Ultimate Sampler. It is the most complete pellet sampler available today. Our standard kit contains popular pellets from the Crosman, Beeman, JSB, Crosman and Benjamin Sheridan.product lines. Our reusable containers hold 25 each of the selected pellets, all neatly sorted, labeled and ready for use. 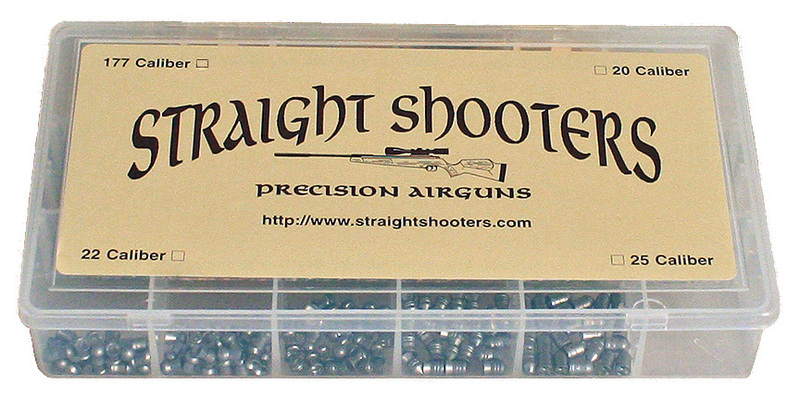 The Straight Shooters Sampler is a great way to find the best grouping pellets for any airgun. Combine the sampler with a chronograph to check the airgun's velocities with different pellets also. The choice of pellets that are offered in this sampler is excellent. A large group of commonly accurate brands and styles. This will really help you dial in the accuracy and find what your gun prefers. However, and I fault UPS for this more than I do the seller, my sampler arrived with multiple dividers broken and the pellets all mixed into large batches. Luckily I have experience with several of them in smaller calibers and know which is which, but a newer airgunner may not have that luxury. Many of the Polymags had the red tips broken off in shipping. I've ordered them by the tin in .22 and never had that issue. Advantages: Large selection of typically good pellets for pellet fussy guns. Will make it easier to narrow down the most accurate for you specific gun without spending a fortune. Disadvantages: Seller could possibly look at bubble wrap in shipping vs simply packaging paper as my sample box was beat up pretty good by UPS. The outside of the pellet container was double rubber banded to ensure it did not come open, however the inside dividers did not fare so well and cause several of the sections of pellets to end up as one jumbled mess. Again, I fault the shipping company more than the seller, but a better packaging option may need to be considered.